This page is dedicated to the memory of Charles Rosscoe Maloney, USMC, who died while in service to his country in 1945-46, and to his daughter, Charlotte Maloney Davidson, who generously donated to this website her first edition of Robert Sherrod's History of Marine Corps Aviation in World War II, so that others could find out more about those men and those events. The Marine Corps aces fought some of the hardest battles of World War Two in the Pacific, most notably the grinding struggle for Guadalcanal, where the few pilots of the 'Cactus Air Force' saved the beachhead from Japanese counter-attacks. The Marine fliers also figured in the drive up through the Solomons, and achieved many great successes in late 1943 and early 1944, when, equipped with powerful F4U Corsairs, men like Pappy Boyington and Robert Hanson drove the Zeros from the skies of the Northern Solomons. Later they fought the gritty mopping-up action against by-passed Japanese bases at Rabaul and in the Marshalls. In 1945, they boarded carriers to help stave off the kamikazes and participated in the Okinawa invasion. A pilot from VMF-212 who saw early service with -223, 'Doc' Everton had been flying for 12 years, since the age of 17. Because of his flying and leadership skills, Col. Bauer sent him with the other seven -212 pilots that went with -223 to Guadalcanal on August 20, 1942. As they came in, Captain Everton was struck by the deceiving beauty of the Island, and how inviting-looking green meadows could really be soggy marshes. The Marines already on the ground welcomed the fliers as saviors. "It looked so damn good to see something American circling in the sky," one of them said. Nonetheless, while Everton was busy with getting his tail wheels changed, from hard carrier types to softer ones better suited to grass strips, someone made off with his food supplies. He was directed to a coconut grove and to set up his campsite with captured a Japanese tent, blanket, and bedding. The only tent he could find had a roof, but no sides. That night the Battle of Tenaru started, and Doc was up all night with a .45 in one hand and a helmet in the other. It might have been the next morning when Captain Smith came by holding a map, explaining that the Japs were landing and that Everton was to lead a flight of Wildcats to investigate and "make his own judgement about strafing or returning." They flew out and found the Jap landing craft on the wooded shore. They shot them up with the concentrated firepower of their six .50 caliber machine guns. The effect was wonderful and terrible, as the heavy slugs literally tore the soldiers apart. Everton and his three other planes strafed the men and the boats until the Marine Raiders finished the battle and "there were no more targets available." It was an ideal demonstration of the power of ground and air forces in cooperation. On August 26, the detached pilots of -212 scored six kills, three of them going to Doc Everton. Everton, Smith, Lt. Corry, and Tex Hamilton intercepted a flight of eighteen Mitsubishi G4M Betty bombers that were returning northward. In Everton's first aerial combat, he was over-anxious and started shooting at the twin-engine Mitsubishi from 400 yards out. But he closed in and began to hit the right engine. Bits of metal flew off. It started to smoke and Everton pulled up and over the bomber, then cam at it again. He got within 300 yards, choosing his angle carefully, moving into the Betty's blind spot. The Bettys carried a fixed 25mm machine gun in the tail, which could not be turned from side to side, creating a blind spot on either side. He closed in, aimed at the gas tanks, and the whole side of the plane broke into smoke and flame. It fell out of formation, then dove straight down, as it burst into a shower of flaming junk. No parachutes. He opened up the throttle and returned to the flight of bombers, now over Malaita. Picking out his target on the right side of the formation, he made a steady firing pass from close range. The plane turned, and Everton countered, firing into the pilot's compartment. This plane too began to smoke, and began a long dive into the sea. As the rest of the Jap bombers continued homeward, fuel and ammo consumption compelled many Wildcats to go back to Henderson Field. But Everton and Smith continued, starting at opposite ends of the row of Bettys. Everton shot up his third victim of the mission, seeing it trail into the ocean. He also hit a fourth in the engine, but this only counted as a probable, as he didn't actually see it crash or explode. By September 1, Everton and the other -212 pilots who had served with -223 were relieved and went back to Efate. He returned to Guadalcanal, on October 16, when Joe Bauer saved the McFarland. Two days later he co-led a mission with Frederick Payne, each leading three planes that intercepted the bombers at about 26,000 feet. Everton rose above the bombers to engage the Zeros above. For some reason the Zeros were doing slow rolls and other aerobatics. Everton got behind one and opened up on it with all six guns. It exploded into smoke and flames. However loud these explosions were, a pilot could only hear his own engine and radio. During combat, the radio was filled with the excited shouts of the pilots and the enthusiastic cheers of the ground personnel. Everton got a second plane that day when he luckily found himself behind and above a Zero. He dove, fired, and sent the Jap down in flames. On October 20, Bauer at first held Everton in reserve, scrambling him and four others when a large flight of Bettys and Zeros came over. On his first pass, he started a bomber smoking badly, and recorded a probable. Soon fifteen more Zeros appeared, and the ensuing melee defied accurate recollection, except for its end (for Everton). Again he got above and behind a Zero, ready to open up, when another Zero got on his tail, hitting him with small caliber machine gun bullets and then shaking the whole plane with 20mm cannon shells. Two of the shells burst in the cockpit, injuring him and knocking his leg off the rudder which sent the Wildcat into a spin. He spun down to about 19,000 feet (hoping to look dead to the Zeros) before pulling out of the dive. He had to lift his injured and numb leg with his hand and place it on the rudder pedal. Heading back to Henderson Field, he radioed that he was coming in for an immediate forced landing. "You can't land here." he was told. "The hell I can't!" he replied, and by then he was on the deck. He described the results later, "The plane was junk when I got it down. They stripped off a few useful parts, but the rest of it just went on the pile. The fragments of shrapnel are very sharp, and they slash through the thin metal of the plane like a razor through paper." He was evacuated because of his wounds. As the campaign moved into 1943, the Japanese tried once more to push the Allies off Guadalcanal. In this second phase of the campaign, Marine Corps aces 1st Lieutenant Jefferson J. DeBlanc and 1st Lieutenant James E. Swett received Medals of Honor for breaking up Japanese formations and shooting down large numbers of aircraft in single missions. Jim Swett was a Marine Corps ace and Medal of Honor winner who served with VMF-221, Marine Air Group 12, 1st Marine Air Wing. He saw action in the second phase of the campaigns for Guadalcanal, in the Solomon Islands. He won the Medal of Honor for shooting down seven Japanese dive-bombers on his first combat mission, and survived being shot down himself. By spring of 1943, Guadalcanal was no longer on the front line. Lt. James Swett arrived on the island at this time. 22 years old, he had enlisted in the U.S. Naval Reserve in August 1941, and appointed an aviation cadet in October. In early 1942, he won his wings, as a Marine Corps Second Lieutenant, in Corpus Christi. He continued his training at Quantico, Lake Michigan, and San Diego before being shipped out to Pearl Harbor and Espiritu Santo. 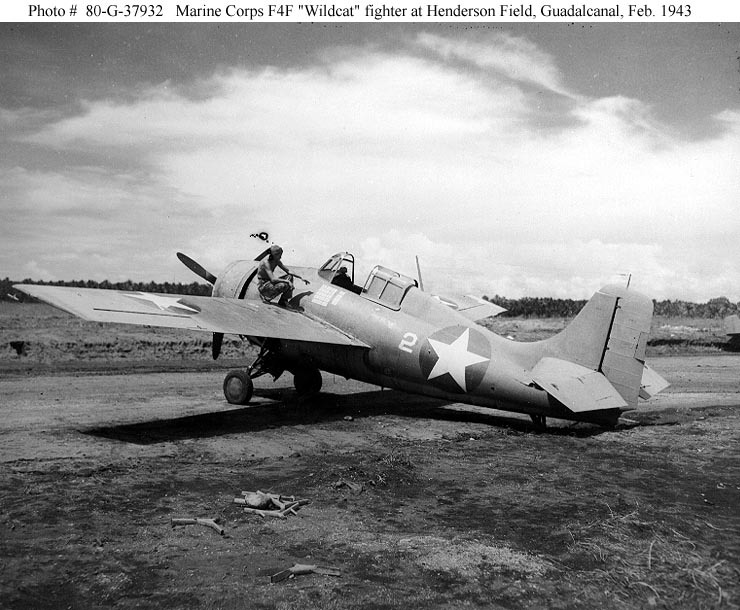 On his arrival on Guadalcanal, he was assigned to VMF-221 operating out of Fighter Strip 2, which typically flew Wildcats for raids on Japanese bases farther up the Solomons. On April 7, Admiral Yamamoto ordered a major Japanese strike at Guadalcanal, involving almost 400 planes from both the Japanese Army and Naval air forces, a larger force than that used at Pearl Harbor. On this morning, Jim Swett was flying a standard defensive dawn patrol with 3 other Wildcats. Gaining altitude, they flew out over the Russells, patrolled uneventfully for two hours. With fuel running down, they landed back on Guadalcanal, only to receive word from the coastwatchers that a major Jap offensive was on its way. All available fighters, including the four Wildcats that had just landed, were readied and launched, 76 in all. Ships and ground forces also prepare; "Condition very red." was announced. Now Swett's division was ordered to Tulagi Harbor, and protected targets there from Japanese dive bombers. As Swett's division climbed to 15,000 feet, another pilot radioed, "Holy Christ! There's millions of 'em!" The Wildcat superchargers cut in, and they continued to climb above 17,000 feet. Now over Tulagi, he spotted the enemy, about 20 planes heading right at his four. The Aichi D3A Val dive bombers began their shallow dives, aiming for the U.S. ships below. Not yet having fired his guns at the enemy, Swett remembered that the armorers crammed in 15 or 20 extra rounds today. Swett's Wildcats closed on the Vals, but suddenly Zeros appeared above. It was a deadly race, to see whether the Wildcats would reach the Vals before the Zeros engaged them. Swett focused on the nearest dive bomber. When it came within 300 yard range, he opened up with his 6 fifties, hitting the Val which started to smoke, burn, and twist out of control. Bombs exploded amidst American ships in the harbor below, as Swett dove down toward a second Val. He pulled within range, got off another perfect burst; there was an explosion and the Val disintegrated! As he dropped down to 2000 feet, he closed quickly on a third Val. But he had to be careful on the deck; it was no place to be in a Wildcat with over 100 highly maneuverable Zeros. His gunfire hit the Val, but it refused to burn, and it pulled up. As Swett tried to stay close he felt a heavy vibration; a gaping hole in his left wing appeared and the outboard gun went out. Despite this damage, Swett stayed with the Val, and continued to pour shells into it. Finally, the Val caught fire and smacked into the trees. He's down at 500 feet, but Swett had scored victory number 3. He realized now that his own anti-aircraft fire damaged his wing. He checked his instruments, and confirmed that the Wildcat still responded to the controls. Spotting more Vals, presumably returning from dives on Tulagi Harbor, he planned to bounce them from some nearby clouds. He flew into the clouds, and emerged almost in range of the last of the seven Vals. He closed until the Jap filled his gunsight ring, then opened up. Metal fragments flew off, a long streak of flame reached out, and the smoking Val plunged into the water below. Victory no. 4! For the first time this morning, Swett noticed the rear gunners in the Vals. Why hadn't he noticed them before? Miraculously, none of them had hit him. He shortly found and downed his fifth Val bomber. He was an ace - only minutes after seeing the enemy for the first time! He moved up to the next Val, which soon came into range. Swett's Wildcat was still running smoothly, and there was still some ammo left. When he was directly behind the Val, he fired his five working guns and brought it down. He couldn't quite believe the turn of events, and wondered where the protecting Zeros were. He soon closed in on his seventh intended victim. He fired his five guns, the Val began to trail smoke and dove into the sea. He was contemplating his next move, when ... Whang! His canopy was shattered. One of the Val rear gunners had opened up on him first. He fired back, but a crashing thump told him that the Val gunner had his range. Swett's fire took its toll, and the Val began to smoke, and then his guns cut out. He was out of ammunition. Now he had to return to Henderson Field, without hanging around to confirm his eighth kill. His engine began to sound bad, and Swett saw that his oil pressure gauge showed zero. The engine was burning up, and quickly stopped altogether. Too far from Guadalcanal, he had to ditch off Florida Island. As he slowed to 140 knots and descended to 500 feet, anti-aircraft guns opened up on him again. He continued to lose speed, jettisoned his canopy, and braced himself for the shock of hitting the water. On impact, he banged about and broke his nose; the Wildcat filled with water very quickly, and Swett was dragged down under the water. He struggled with his Mae West and life raft, yanking them free and bobbing up to the surface. He fired his .45 to attract attention, climbed into his life raft, spit up a lot of seawater, and waited. Soon, a picket boat came up and pulled him aboard. He was treated to a combination of Scotch and morphine, which made him very sick; he spent six days in the hospital. Swett knew he had scored seven kills, but seemed to face some skepticism. An Army Intelligence office interviewed him as well as other witnesses and Swett was awarded the victories. Overall on April 7, the Americans downed somewhere between 21 (post-war Japanese sources) and 39 aircraft (American claims). The Jap dive bombers scored some hits on the U.S. fleet, but nothing like they had hoped for. On two later raids in June, the Japs were beaten back severely. After that they never again raided Guadalcanal in daylight. Lt. Swett went on to score 8.5 more victories while flying F4U Corsairs, for a total of 15.5. He spent most of 1944 training and filling up a new Corsair squadron, VMF-221. This squadron was assigned to Bunker Hill, in direct response to the kamikaze threat. As Jim Swett noted in Aces Against Japan: Vol II, the Navy Captain didn't want the Marine fliers on board, but when they landed their Corsairs twenty seconds apart, he was impressed. Bunker Hill and the Fifth Fleet sortied from Ulithi in February, 1945, for strikes against Okinawa and the Home Islands. Operating as an anti-kamikaze barrier, the squadron suffered heavy losses, mainly from ground fire over Japanese airbases. On May 11, 1945, Swett was flying his Corsair on CAP, leading his section. They had shot down a Frances scout plane and a Betty bomber, when they got word to go after a Jill kamikaze. Swett caught up with the low-flying suicide plane, and "tore it up with all four 20mm cannon." The plane dived into the ocean. He headed back toward Bunker Hill, and as he got into landing formation, two kamikazes hit the carrier. The first landed in the middle of the crowded flight deck, and its bomb killed half the anti-aircraft gunners on the port side of the ship. The second one, a Zero, crashed right into the VF-84's ready room, killing about 30 pilots. The ship caught fire, which caused more explosions; in all, almost 400 men were killed. Swett collected about 24 of the circling airplanes, mostly Corsairs, and they dropped dye markers and Mae Wests for the crewmen swimming in the oily water around the stricken carrier. Then they flew over to Enterprise, whose LSO skillfully landed all of the 24 homeless airplanes. As soon as the pilots left their planes, Enterprise crew pushed most of them over the side; there was no room for the extra aircraft. After several days, he caught up with Bunker Hill, smelling of burnt flesh and smoke, for an awful trip back to Pearl Harbor. After the war, Jim Swett worked in the family business as a manufacturers' rep, and stayed in the Marine Corps Reserve until 1970, when he retired as a Colonel. Edward Sims, Greatest Fighter Missions, Harper and Brothers, 1962 - This sequel includes U.S. Navy and Marine Corps pilots, especially for details of Swett's Apr. 7, 1943 mission. Continue with more Marine Corps Aces - Walsh, Hanson, and other Corsair fliers.